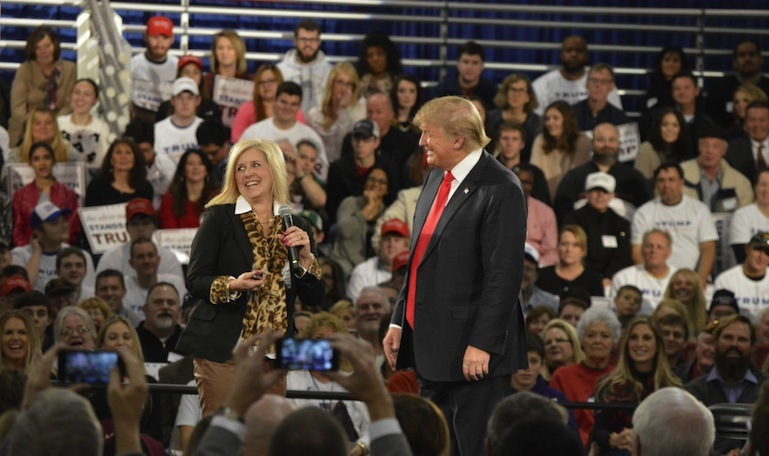 Republican presidential candidate Donald Trump on stage with Tamara Scott, a Republican National Committeewoman for Iowa, during a town hall at the Iowa State Fairgrounds in Des Moines, Iowa on Dec. 11, 2015. Many Iowans say they will be glad when presidential candidates move on to New Hampshire Tuesday morning. Why? “Probably the same reason as everyone else is: the advertising, the constant bombardment of ads and people knocking at my door,” Benjamin Chalkley, 51, of North Liberty said. Chalkley, a Democrat, said he planned to caucus for Hillary Clinton. “Well, it’s just that Iowa has a continuous, it seems like it’s a continuous cycle,” said Steven Reed, 50, a Republican from Carlisle who was leaning toward caucusing for Ted Cruz. Several Iowa voters had varying views about life after Feb. 1 in Iowa in interviews conducted for an IowaWatch/College Media Voices of the Caucus project. Their comments are in the IowaWatch Connection program that aired on radio stations the weekend leading up to the caucuses. It’s been a month since Iowans caucused. How do Iowa’s results look now that more than a quarter of the country has indicated its presidential preference?